Jingwei Xie, Ph.D., left, and Mark Carlson, M.D., may have found a solution for a better hernia mesh. UNMC faculty Mark Carlson, M.D., and Jingwei Xie, Ph.D., are working together on a solution for a better hernia mesh. And they think they may have found it. Holes in the abdomen can't always be effectively sewn together, so they require a patch or "mesh." Maybe someday regenerative medicine will (literally) fill that hole. "But we're not there yet," Dr. Carlson said. Instead, physicians now mainly use synthetic materials -- plastics, which are, "Not perfect," Dr. Carlson said. The body can have adverse reactions to foreign material. Or, "biologic mesh," derived from derived from tissue such as skin, which is much more body-friendly. But, "I wince every time I use it," Dr. Carlson said. Biologic mesh is so prohibitively expensive it requires level upon level of scrutiny by hospitals and insurance companies. We need something the human body will approve of, at a price the health care system will, too. 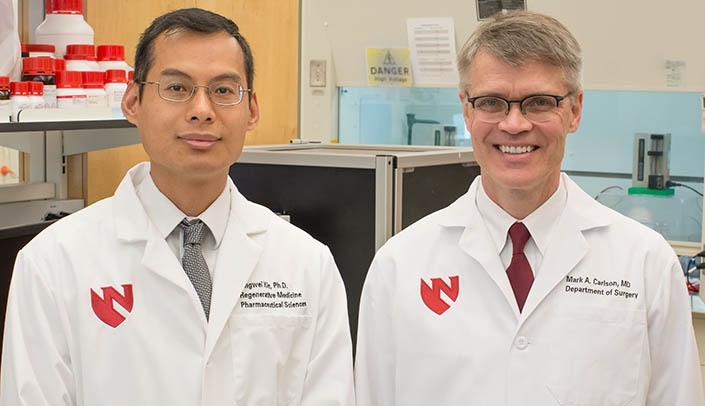 Dr. Xie, a biomedical engineer in the Department of Surgery and Holland Regenerative Medicine Program at UNMC, and Dr. Carlson, a surgeon-scientist, who has a dual appointment at UNMC and the VA Nebraska Western-Iowa Health Care System, are developing a mesh engineered from man-made materials - synthetic polymers. But, which they believe will be much more friendly to living tissue. "The secret sauce is how you put (the particles) together," Dr. Carlson said. "Dr.Xie is able to control things at the nano scale." This means chemistry at the molecular level, to give the mesh "in vivo," or living, characteristics. Its highly porous structure allows optimal cell and tissue growth. "The surface composition and nanotopography reduce the adhesion formation," Dr. Xie said. Native tissue would incorporate it and form firm attachments. "The tissue actually grows into it -- and that reduces the risk of infection and strengthens the native tissue," Dr. Carlson said. The body would eventually absorb the material. The idea, and its initial preclinical data, have resulted in a grant from the Otis Glebe Medical Research Foundation. The team will test the mesh in porcine models in hopes of heading toward FDA testing and approval. Drs. Carlson and Xie are working with UNeMed, UNMC's technology transfer arm, and are applying for a provisional patent of the technology. With further preclinical data, the team could partner with a private company, to keep the research moving, or apply for a small business grant. Through it all, "The Omaha VA has been enormously supportive of our lab," Dr. Carlson said. Great work, Dr. Carlson and Dr. Xie! This science is sure to make many lives better. Thank you for all you do.